The lawyers at Strom Law Firm often get the question, “Do I need a will.” The answer is quite simple. Why wouldn’t you want to plan for the future and make your wishes known? It is important to know about South Carolina wills: protecting your wishes. No one wants to think about their own passing. However, you more than likely have specific ideas concerning who will receive any money in your bank account, your home, and your personal property in the event of death. If you have children, you can designate who will care for them, and an independent party responsible for approving the distribution of money for financial needs. A properly executed will can ensure that your wishes are enforceable and that your loved ones are protected. Most people want control over health care decisions in the event of catastrophic or terminal illness, to make their wishes known concerning live saving health care measures such as resuscitation. Executing a living will and power of attorney can ensure piece of mind. Whether you have never executed a will, need to update your will, or have questions about how to best protect your assets and ensure your medical wishes are honored, the will and probate attorneys at the Strom Law Firm, LLC are here to help. In our free consultation, we will assess your needs, give you feedback, and provide guidance on how to proceed. No matter your immediate needs, call us today for a free consultation to learn more about how we can help. If there is no spouse or children, to his or her parents equally. If there is a spouse and children, 50% passes to the spouse; 50% passes to the children. Any apportionment beyond that listed above requires a properly executed will. You have the right to decide what types of life saving measures may be used in the event of illness, and who can make critical health care decisions on your behalf in the event you are unable to do so. It’s important that these documents are implemented before it’s too late. You also have the right to select someone to handle your affairs, and make legal decisions for you. A health care power of attorney is a legal document which lets you authorize someone you trust to make health care related decisions for you in the event of serious illness. A health care power of attorney may be drafted to give power immediately or to become effective in the future “springing” as set forth in the document. Similarly, a durable power of attorney extends beyond health care needs to include the ability to execute legal documents, make decisions on your behalf, and take care of your finances. Given the power authorized in these legal documents, it is extremely critical that they be drafted consistent with your wishes. A living will outlines how you feel about care given to sustain your life including tube feeding, breathing machines, even organ donation. Protect yourself, your assets, and your family. 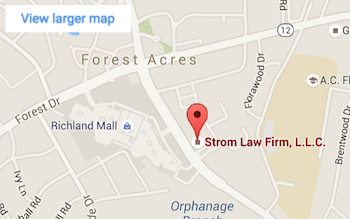 Call the Strom Law Firm today to learn more about South Carolina wills: protecting your wishes.